Can’t say I fell in love with Bangalore. The traffic and pollution and half made roads didn’t really endear me to the place, especially since I kept having to make hour long journeys in open rickshaws just to get between projects. Somehow expected to see lots of fancy glass covered IT parks, but never really came across them. Mostly low level houses and lots of newly constructed apartment blocks. Buses are rickety as ever, but quite a few of them have electronic destination displays which I was very impressed by. Traffic police wear white stetsons pinned up on one side. Very peculiar and old world reminiscent. The moustache is massive out here, and everyone seems to have one. I almost feel ashamed at my utter lack of genetic ability to grow a respectable tash. I reckon if I could I would’ve grown one just for a jokes attempt to blend in. Like everywhere in India food is a big part of culture, and I’ve been tucking into South Indian thalis, or ‘meals’ as they’re actually called. Basically you get a bunch of standard rassams, dals, veg, chutney, papad and rice. All under Rs.100 which is about £1.50. Tasty as. Surprisingly not very spicy. For spicy food you have to eat in Andhra style places. The food here is served on banana leaves rather than plates, and the meal options are veg or non-veg. The non-veg addition is either chicken or mutton fry. I got taken along to a couple of those by some of the guys from Dream A Dream. Too good! As always in any city, life after projects transitions into fun times and eating and drinking. Went out to a rooftop bar called 13th floor just off the famous MG Road, to party while watching the rain come down. Very cool. Followed by beers in a pub called Tavern at the Inn. Really not so cool. But we got talking about drinks from other countries and I mentioned Clamato, which is big in Mexico, and amazingly the waiter made it for us. It’s basically a spicy Virgin Bloody Mary, in a beer mug with salt around the rim, and mixed with lager. Sounds horrible. Tastes great. The guy made it perfectly! Was gutted that I’d left my camera in the car. Ashoka India – one of the main reasons for coming here was because the Ashoka team requested help with turning the idea of confluences into a practical reality. We looked particularly at designing confluences related to the provision of housing for all (basic premise in the very scruffy sketch below). SSP, SSK, SAST, SSEN, SRPL – I’d originally been approached for help with creating collaborative services and operational efficiencies between SSP’s different entities, but after a few sessions in Bombay they were really keen for me to facilitate their two day management workshop in Bangalore, which I did. The primary aim was to ensure mission congruence to build the trust platform for future working together, but in the end we got much closer towards spontaneous organisation around both collaboration and efficiency, which was a great outcome. The best part of it for me, was that the room we used had a blackboard. Weird but fun to be using chalk. Like being back in school!! IDPMS – This is an organisation involved in the development of sustainable rural community based social enterprise. They’ve worked on very large scale rural and water projects in Karnataka. They were present at SSP’s workshop as the original facilitators particularly focused on Governance. Afterwards they approached me to help them with their own Governance design. Like many organisations with scale and reputation they have many heavyweights on their board but find it very difficult to gain value from their involvement. The solution lay in simplifying the board structure and replacing much of it with advisory groups around the key knowledge and service areas they focus on. Alchemy – This falls more into the category of social business than standard development entity, as they run an English language and interview skills course to help unemployed people move into jobs. They also find work and aim for 100% placements of all course graduates. We looked at their cost modelling and the development of value-add and parallel services that might ensure enough profitability to keep their organisation achieving its goals of developing the potential of young Indians. Dream A Dream – I didn’t actually do any formal work with Dream A Dream this time because it just happened to be a crazy week for them, but they deserve a mention just from the perspective of raising awareness about what they do in terms of long term development of children from vulnerable backgrounds. We talked about the challenges of scaling from working with 2000 children to 36,000 schools. Simply growing organically or trying to create cost efficiencies in the existing model is not going to be the answer so they’re looking at redesigning their programmes in a pilot partnership with 10 schools. 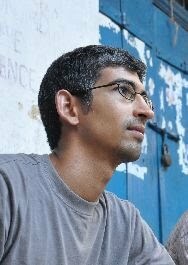 Vishal’s vision is to have no more children on the street in India by the end of his lifetime. Believe it. Where there’s a will, there’s a way. Grassroutes – Runs road-trips for social change in India. We discussed realistic possibilities for transforming into a viable self-financing enterprise, potentially by opening up the target audience into an older demographic that can and will pay for a form of social tourism. This would support the primary mission while cross-subsidising the fellowship program that they normally run. Well worth checking out if you want to know more about the social landscape in India. Finally to end on a note of remembrance. I stayed with the parents of a friend of mine who passed away in 2003 of Leukaemia. Along with a small number of other children who lived down the same lane, Udai Kamath was a daily part of my entire childhood. We grew up and played together mostly every evening. He was there at all my birthdays and major events, and was one of the most genuinely beautiful people I’ve ever known. I looked at pictures and remembered old times. My memory of much of my childhood is heavily swiss-cheesed, but Udai stands out amongst all the kids I knew for his amazing good nature and sense of fun and mischievousness. Our lives are genuinely less bright for his passing. I wish there was anything I could say that would do justice, but I don’t have the words. Instead I’ll use my sister’s, from a poem she wrote in memory of Udai on her fantastic blog Lupus In Flight. Dedicated to Udai Kamath. 1977 to 2003. Remembered and missed.